Allows you to apply a blurring effect to multiple images at once. 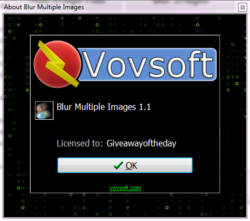 Blur Multiple Images 1.1 was available as a giveaway on May 1, 2018! 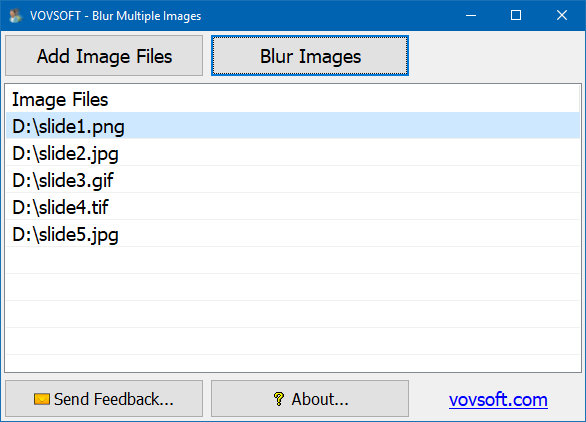 Most image editors enable you to apply various types of blurring effects to images, but the process is not always as straightforward as many users would like, and editing multiple files can take a lot of time. Blur Multiple Images is a very simple application that seeks to offer a more accessible solution. It allows you to apply a blurring effect in just a couple of easy steps. 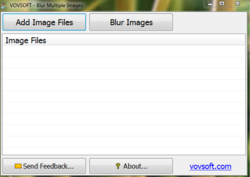 Blur Multiple Images makes the task of importing and blurring pictures as simple as possible. 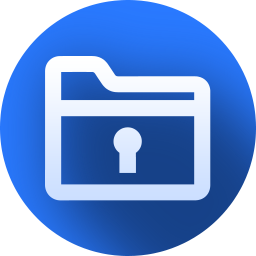 Once you have added one or more files, you can view the list in the main window and remove any items that were imported by accident. How would you improve Blur Multiple Images 1.1? I think this Developer wanted to 'better' the idea of creating decent bokehs going the whole hog!? On more serious note - the Cheekiest concept too!! : Get this ONE Effect app dressed up in 'Software' form for FREE, except we'll slap Nag screen and Ads (oh, and no upgrades) - UNLESS you pay 10 box for it!!....... Leaves you breathless! Hi, Dumbest concept I've ever seen!! Go ahead and RUIN not just one, but the whole batch of Images, haha! :) I think this Developer wanted to 'better' the idea of creating decent bokehs going the whole hog!? On more serious note - the Cheekiest concept too!! : Get this ONE Effect app dressed up in 'Software' form for FREE, except we'll slap Nag screen and Ads (oh, and no upgrades) - UNLESS you pay 10 box for it!!....... Leaves you breathless! My family and friends are quite homely this might just be the ticket! I spent £600+ on a camera and a further £600 on lenses to get super sharp images why in the name of whoever would I want to Blur them. When I want blurred background I widen the Aperture that way I get the pleasing effect require just slapping blur on the whole image is crazy ...GOTD not today thank you! A case of beer accomplishes the same effect. I guess I'm a professional and didn't know it!!! I've been blurring images that way for years! Justin Alias, I guess I'm a professional and didn't know it!!! I've been blurring images that way for years! But don't worry...tomorrow they'll give away one to unblur them. Then, hopefully another video converter. Is this the same company that offers the text jumbler?! The program installed in Win10-Pro. Short and one-trick pony. I did see a difference between original and the blurred one, after I zoomed in and put on my good glasses. I was looking for any demo on youtube... none. I was looking for any demo on youtube... none. I'll pass. Amargein, yeah like automatic face and body detection and keep the detected faces sharp but say an adjustable radial blur centered on each face might be interesting in some compositions. 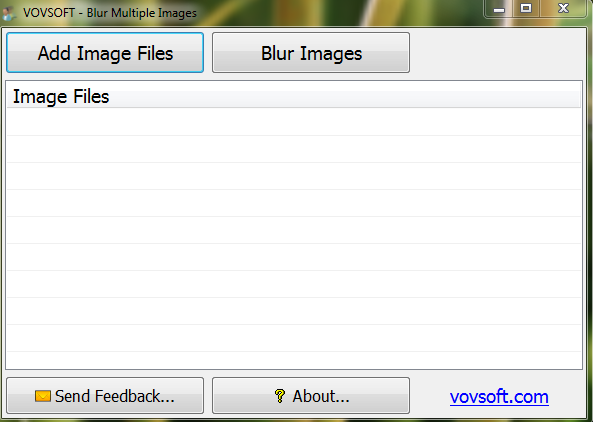 But simple batch blur anyone can do in always free Irfanview as well as other batch filters. Just no built in face detection and a way to combine it with filters or radial graduated blur filters. As they would likely requrie true AI engines to combine usefully for batch operation. 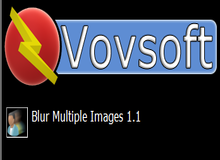 Yeah, I did a double-take when I saw this - at first I thought it was an "Deblur" program. Now, like Donaldtrumpet, I'd be interested to know who would need (or want) it.